Let’s face it: whether you have a new or old wheelchair, the padding on it wears down and can begin to cause pain as you sit for extended time periods. The best wheelchair cushions are meant to provide relief and additional comfort when you are sitting. Wheelchair cushions can also provide relief to specific areas where pain and pressure are more likely. For tailbones and pressure sores, having the right wheelchair cushion can be the difference between a comfortable ride to the store or a painful reminder. We want to help ensure you experience maximum comfort at all times, so we’ve created a breakdown of the best wheelchair cushions for 2018. 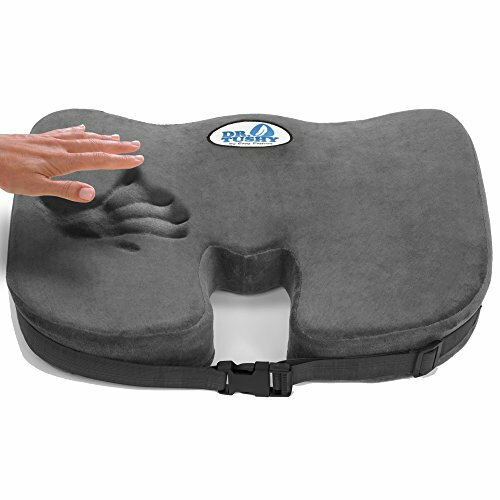 This gel cushion is a great option for those seeking a firm cushion for lower back support. When you sit down on this cushion, you’ll feel a lot of relief to your lower back and tailbone. The cushion has gel technology to provide support and relieve pain. The cushion is quite thick, so it can be too firm for some, but it works well for your lower back and even your hamstrings. The best thing about this cushion is its use for people in wheelchairs. While it may not be the best option for occasional use, this cushion could relieve a lot of the pain associated with spending the majority of your day sitting. An inflatable cushion is a great choice for people traveling or trying to avoid pressure sores. 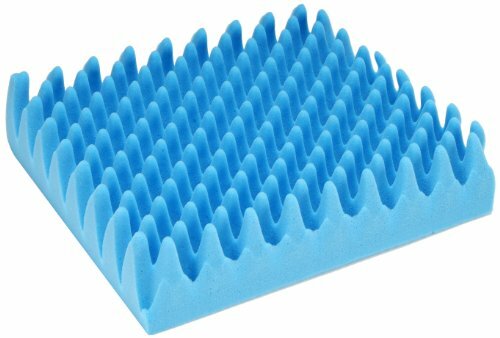 This product is a fantastic alternative to memory foam or a lot of the similar cushions you find on the market. This is a good cushion for travel because it can be packed away and inflated only when you need it. The size of the cushion fits on most seats and does not have any awkward shape. 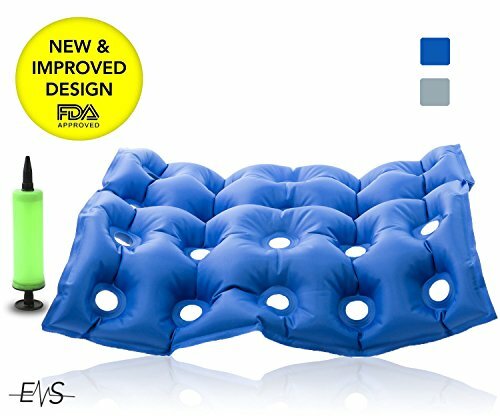 The main thing we notice about this inflatable cushion is that if you overinflate, it lowers the amount of comfort you experience because it becomes to firm. 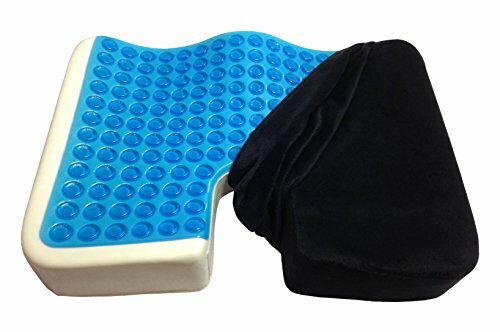 The Xtreme Comforts cushion helps with sciatica or severe lower back pain. This cushion provides a ton of relief to the lower back by adjusting your posture. The foam cushion forces youto sit in a more upright position, taking the pressure off your back and legs. The Xtreme Comforts cushion is portable and can be used outside of the wheelchair. For people dealing with things like sciatica and fibromyalgia, this can also be a lifesaver in your everyday life. The cushion is large enough to cover the entire chair, so you can remain comfortable for as long as you need. If you enjoy the feeling of memory foam and its firm support, that then this will be a great cushion for you. 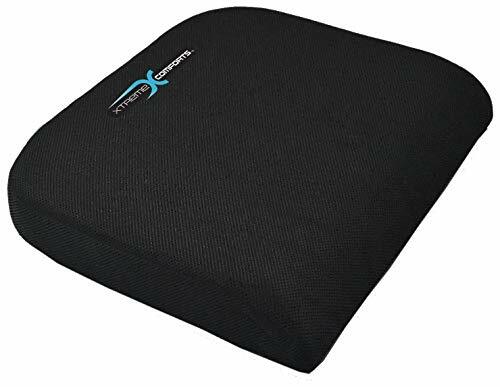 This premium seat cushion is an excellent choice for people who enjoy the feeling of memory foam. It helps relieve pain and soreness due to tailbone or lower back injuries. The cover on the cushion is velour, and the entire pillow is washable. Overall, the cushion functions as you would expect it to, but as with most types of memory foam, it loses a lot of volume over time and will need to be replaced. If you want something to help ease your lower back and tailbone pain without a fuss then this is a great option. If you are looking for a simple cushion to get the job done without all the fuss, this is the way to go. Thiscushion works well in wheelchairs and is portable so it can be transferred to recliners, couches or inside the car. The cushion helps distribute your weight equally, so there is no specific pressure on one area of the body. That pressure is what causes pain and soreness to your lower back and tailbone. This one is made from polyurethane foam and is reasonably priced. This overlay covers every nook and cranny of your wheelchair with a foam insert. This is the best of the best when it comes to seat cushions. You get everything you need and a little more. The cushions are intended for wheelchairs only, so it isn’t moveable. But it does provide padding on your rear, back, arms, and thighs. This is great for people with sensitive skin or more severe pain. The cushion functions as you would expect. The only downside is that with most foam cushions they tend to wear down and become flat. This cushion is a simple way to take pressure off your tailbone and distribute it equally throughout your buttocks and lower back.It comes in two different heights, either 2 or 3 inches. There are also different width options, so you can find the right size to meet your needs.. The cushion functions as you would expect. The only downside is that with most foam cushions they tend to wear down and become flat. This cushion would be better if it provided a different base to offer a bit more support. Sitting in any chair for prolonged periods of time not only becomes uncomfortable, but it can also be extremely painful. Why Should You Get A Wheelchair Cushion? Sitting in any chair for prolonged periods of time not only becomes uncomfortable, but it can also be extremely painful. Sitting for long periods of time can also cause pressure sores, which can lead to skin infections. Wheelchair cushions can help evenly distribute your weight and alleviate pain and pressure from prolonged sitting. If you have pain, you don’t need anyone to tell you that you need help to alleviate it. Let’s take a look at the different kinds of cushions and how they can help. Comfortable and works well for most situations but can get worn down quickly. Does not wear down easily, but it can be too stiff and firm for people dealing with more severe pain. Great option that blends the two materials, but we still find that it can be too firm for most people. This alternative is easier to clean, you can decide how firm you want it to be, and you can pack it easily for travel purposes. Thistype contours to match the shape of your body, but it also does flatten out over time. If you or a loved one has pain, you will want to alleviate it as fast as possible, so it’s important to make an informed purchase. If you or a loved one has pain, you will want to alleviate it as fast as possible. Therefore, it’s important not to make an uninformed purchase. Think about these things before buying. If you have difficulty getting in and out of the chair, then you may want to consider getting something small that doesn’t feel like it’s getting in your way. Some cushions are bulky and slide around, which could result in a fall. You also do not want to get something so substantial and difficult to place that it prevents you from using it. Think about your pressure areas. Is the cushion you’re choosing relieving that specific area or pressure? If the pain is in the tailbone area, be sure to get a cushion that reduces pain for that area. Pay close attention to the support offered by the cushion as well. If the cushion is foam or memory foam, it may wear down quickly and become flattened. Some cushions are better than others, so you will also want to read reviews and see what other people have experienced before making a purchase.